Selling Property in Sunny Beach Bulgaria is a very simple process if you appoint the right agent to represent you. Appreciating Assets have been Selling Property in Sunny Beach Bulgaria for Irish and British owners since 2008. During this time we have found buyers for over 1,500 properties and this number continues to grow every week. During the last 10 years of Selling Property in Sunny Beach Bulgaria we have learned a great deal about the market and the reasons why people buy and sell in Sunny Beach. Some of most popular resorts in Sunny Beach are Poseidon, Palazzo 1 & 2, Sunny Day 1,2,3,4, Holiday Fort Club, Trakia Plaza, Barcelo Royal Beach Club, Sea Dreams, Summer Dreams, Royal Dreams, and Yassen. The most popular properties with Buyers in Sunny Beach at the present time are Studios and One bedroom apartments. Two bedrooms are selling well but they must be at the correct price. 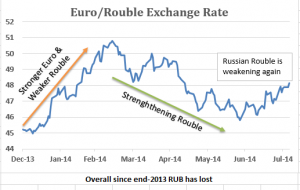 The main reason for this is that the budgets buyers are coming with are smaller than in previous years and this trend has been in place since the collapse of the Russian Rouble in 2014. To Sell Property in Sunny Beach Bulgaria in 2018 will be achieved by placing your property for sale at a price that reflects the current market. To sell your property in Sunny Beach Bulgaria please Contact Us. As a business that specialises in selling Bulgarian property we have been concerned by the recent European and U.S sanctions imposed on Russia. Given the high level of activity in the Bulgarian property market by Russian buyers we were concerned that these sanctions would have negative effect. We are delighted to report to that we have not seen any negative fall out to date in the number of Russian Buyers travelling to Bulgaria, however we must note that the weakening Rouble is causing many Russian Buyers to seek discounts to compensate the cost of purchase. 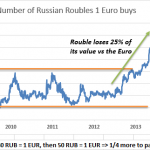 The charts below demonstrate the fluctuations between the Rouble and the Euro since 2009.
average Russian Buyer needs approx 7% more Roubles to buy a Bulgarian property than they did during the same period of 2013. An example of this was a recent sale of two properties in Santa Marina in Sozopol where the purchasers requested a discount to allow them to complete the purchase. The discount agreed was 8% of the asking price as they needed to factor in the loss in value of the Rouble from when they had initially started to search for a property. Despite the weakening Rouble the real proof of the strength of the Russian commitment to Bulgarian property was demonstrated during our recent auction where we sold 17 properties, with 15 of these going to Russian Buyers. Our next Auctions will be on August 28th and October 2nd, please contact us if you would like to discuss placing your property for sale or if you require a catalogue of the properties that will be for sale. We are delighted to have another property sold in Sunset Resort Bulgaria. This property was sold within 2 months of coming on to our books proving that there are still high end buyers in Bulgaria. The property itself received a large number of enquiries within days of being placed on the market and was sale agreed within the first five viewings. We still have a number of unsuccessful cash ready under bidders who are seeking a 2 bedroom apartment in Sunset Resort. If you own a two bedroom property in Sunset Resort similar to the property the below please contact us as we may have a buyer for you.